Hard to believe it's been almost a full year since we took that first historic drive in the Locost. It was late September of 2013, and the car wasn't completely finished, but two weeks later it was. We've been driving it regularly ever since, and I don't think we've gone five days in a row without firing it up and taking it for at least a spin around the neighborhood. We've also taken it on hundreds of longer adventures. Or maybe not quite that many, but lots. We do have a couple of updates to report. As we've been bragging all year, the car has been incredibly reliable. The cooling system has been fabulous, the engine is running strong, and even our 10-year-old tires have held up through 5000 grueling miles. However, we did do a little work on the Locost over the past few months, some because we had to and some because we wanted to. The had-to parts included a new throttle cable and a new alternator. 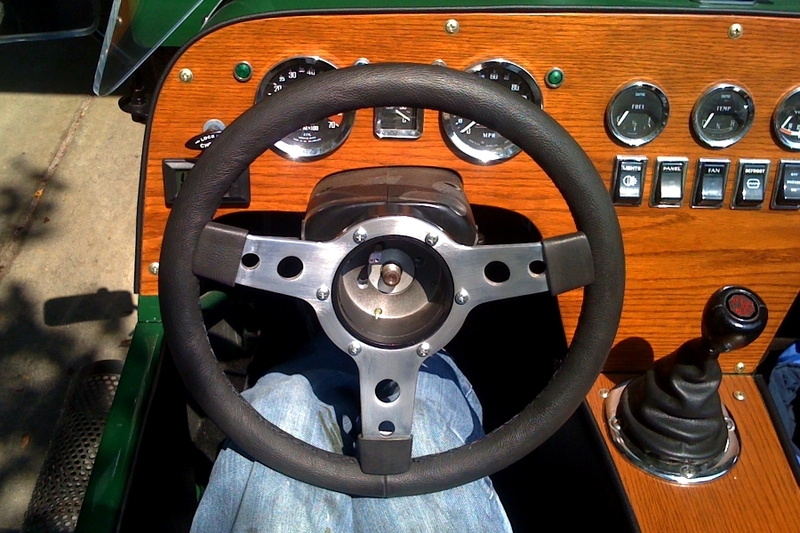 The want-to was a new steering wheel. More about these in a minute, but first things first. A little over a year ago my job pulled me out of Palo Alto and the heart of the Silicon Valley, and deposited me up near the state capitol in Sacramento, smack dab in the middle of the dust and heat of California's Central Valley. 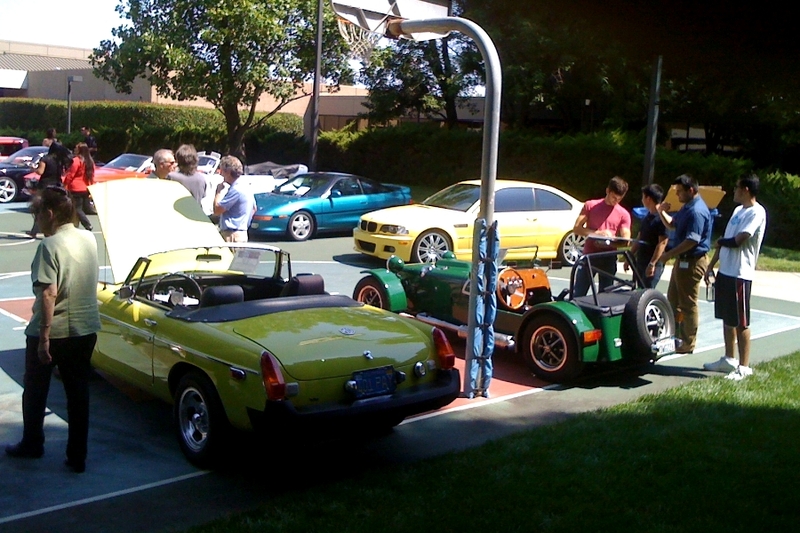 For a year I drove the Miata 100 miles up and back at least a few times a month, and kind of enjoyed the ride, but when the company insisted last May that we start showing up in the office five days a week, the four-hour commute lost some of its allure. One time earlier this year I made the long commute in the Locost. Except for going through three quarts of oil, and getting blinded by the sun in both directions, and suffering through the worst oppressive heat you could ever imagine leaving work in the afternoon, I thought it was pretty cool. Not so cool that we were ever tempted to do it again, however. Instead we started putting a lot of miles on the Miata, which as we said was getting old in a hurry, and would've been just as bad even in a Ferrari or a Lamborghini. Okay, maybe not. So we moved. We found a nice home in the suburbs of Sacramento with a big two-car garage, and we're now close enough to the office that I can easily make the commute in the Locost, every day, at least until it starts to rain again in California, which looks like it won't happen for a while. Even though the weather outside hasn't gotten any cooler, the new shorter commute is no longer east and west so the sun isn't a factor, and our excessive oil consumption has been considerably reduced due to some recent engine work. 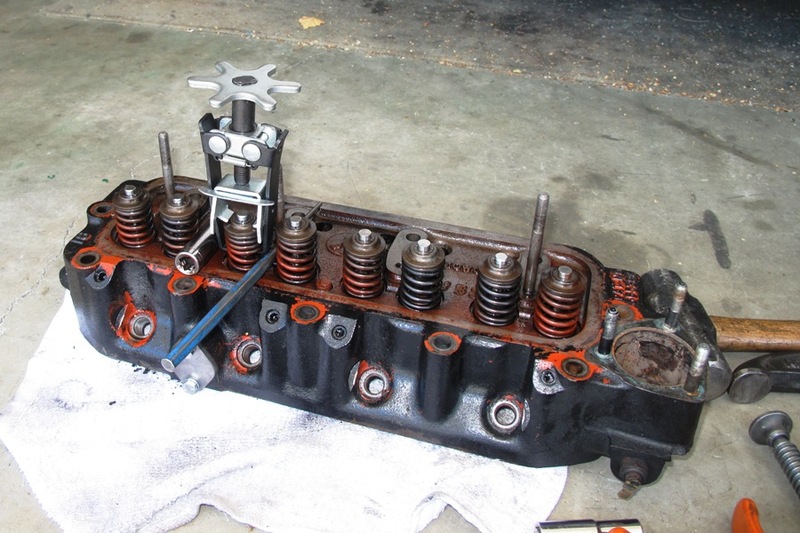 What we did was pull the cylinder head. Everything in the engine looked good, but carbon buildup on the valves had gotten kind of serious after burning through about 30 quarts of oil. So we got out the wire wheel and blasted away most of the carbon, which likely reduced our already-low compression ratio still further, but seemed like the right thing to do at the time. Note that the carbon we were scraping off was good carbon, like you find in carbon fiber and dirt, and not the deadly dangerous carbon dioxide so often seen in the news. 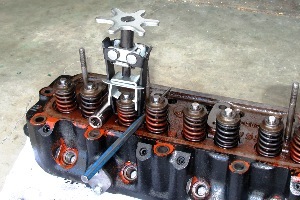 We next set about replacing valve stem seals, which wasn't so much about replacing seals as it was about compressing valve springs with a $12 Harbor Freight valve spring compressor. We probably could've spent a little more and the job would've gone faster, but with judicious use of clamps and spacers we managed to get the first seal replaced in a little less than two hours. After a brief calculation to determine the time needed to replace all eight seals, we made an executive decision to replace only the seals on the intake valves. While we had things apart, we figured we'd repaint the head. 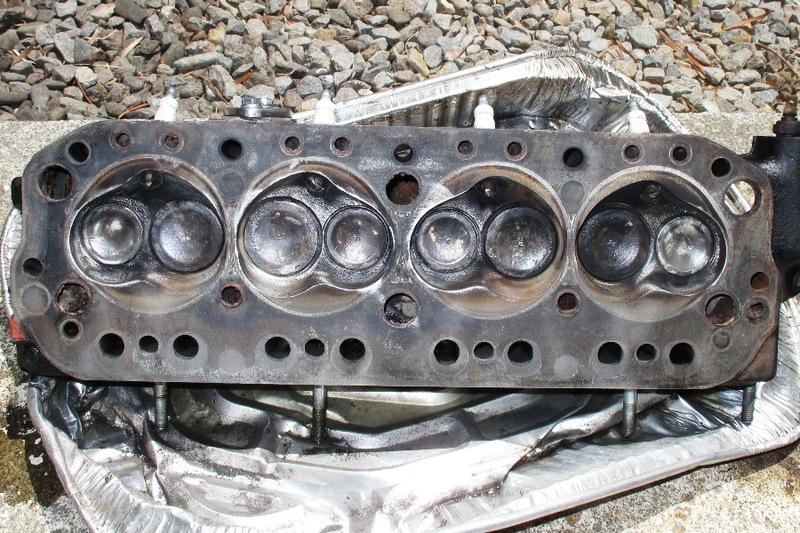 For some reason the quickie job we did last year to convert our bright orange cylinder head to a more subdued black did not last all that long. In retrospect it's possible the lack of prep and subsequent light film of oil still on the head when we sprayed it caused some adhesion issues. In any case the black paint was coming off in a few places, or lots of places, revealing the original orange color underneath, and the cylinder head was beginning to look a little too much like a Halloween ornament. So with the valve seals done we prepped the head for paint, using actual solvents like acetone and brake cleaner. We masked off parts we didn't want painted, like the intake and exhaust ports, and then shot the head with three coats of Moss Motors M.G. dark red engine enamel. 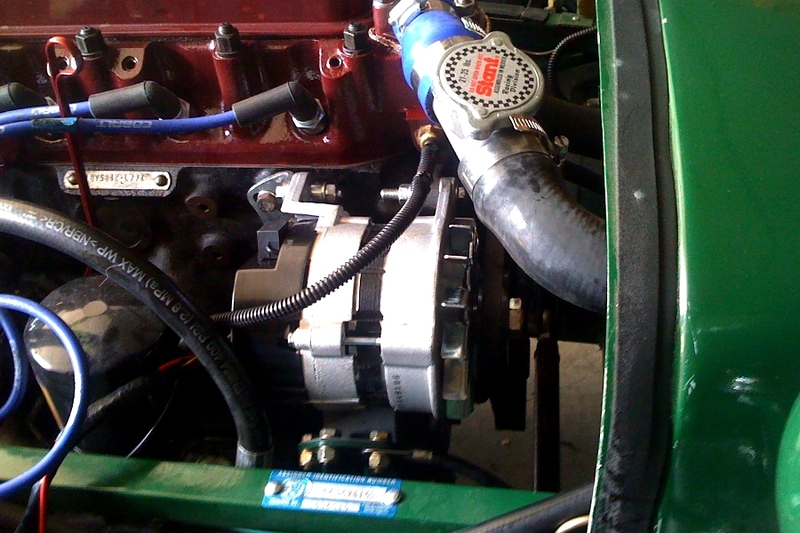 We used this color partly so the head would match the valve cover, and mostly because we didn't have any black paint on hand and we were running so far behind thanks to our spring compressor cost saving efforts that we didn't have time to drive to the local auto parts store. While we waited for the paint to dry we replaced our brand new but short-lived Moss Motors choke cable with a new and improved Moss Motors choke cable. We also replaced our coolant temperature sender with a brand new $7 coolant temperature sender that we expected to work better, and by "better" we mean it would indicate lower temperatures, although this didn't prove to be the case so we ordered a new $23 coolant temperature sender, which we have yet to install but we're confident at that price the sender will easily produce the desired results. When the paint was dry, or close enough, we set the cylinder head on the block and got everything bolted on a few minutes before sundown. We refilled the radiator, checked the oil level, and then took the car out for a 20 mile test drive. When we got back we anxiously re-checked the oil, and if you think a 20-mile drive wouldn't be enough to detect oil usage, trust me, before the seals that would've been plenty. This time the oil level didn't change. As a bonus, when we shut down the engine it just quit. No extra revs, no last gasps. It just stopped. There was one downside to moving to Sacramento. Actually there were many, but one that affected us directly. We haven't yet been able to locate our camera. We took thousands of pictures of the build with that thing, and posted over 500 of them here, but now the camera is missing in action. This is going to have a severe impact on the quality of our website, as we're now reduced to using pictures taken with my ancient iPhone, and just so you understand, unlike modern phones that have real lenses and pixel counts in the megas, the camera in my original iPhone is a toy replica of a real camera. Fortunately this lack of picture quality isn't affecting the Locost or our enjoyment of it. And it's not like we had any skill or talent when it came to taking pictures in the first place. But that Canon G10 did make up for a lot of bad lighting and poor angles. Luckily we do have some semi-decent iPhone pictures of the last few changes we made to the car, including installing a brand new alternator and a new eBay steering wheel. We nursed the old alternator along as best we could, and the fact that we got a year out of it without destroying our cheap NAPA battery is a testament to the incredible string of luck that we've enjoyed throughout this entire Locost build process. 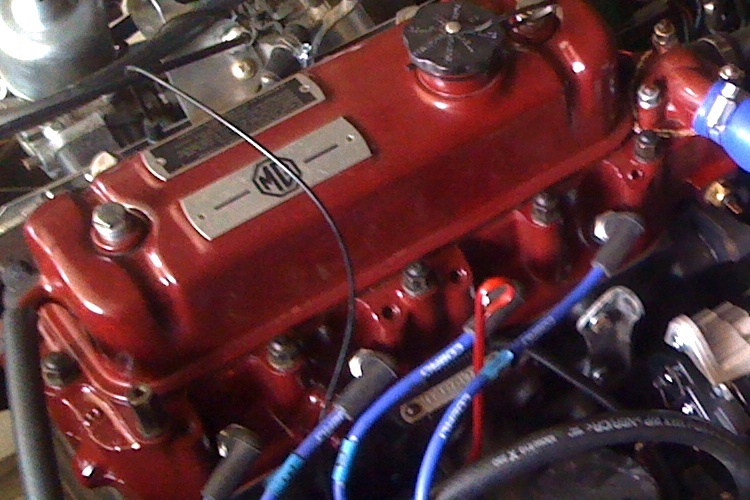 And so even though the alternator sometimes failed to alternate, it worked well enough that the battery was always enthusiastic about starting the car, which we took as a good sign, and we eventually got to the point where we stopped worrying altogether about the occasional voltage lapses. Then one morning we were driving to a Cars and Coffee and we noticed the voltmeter doing something all new and different. Instead of varying wildly between 12 and 15 volts, it just went and pegged itself at 18. As much as we would've liked to blame this on the voltmeter, we knew the old alternator was trying to tell us something, and not something good. So we took a trip to O'Reilly's Auto Parts and forked over $70 for a new brand-X alternator that installed in minutes and has worked like a champ ever since. 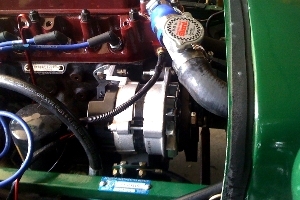 Even at idle it puts out a strong 13-14 volts, something the old alternator couldn't even pretend to do. We had mixed feelings about replacing our steering wheel. 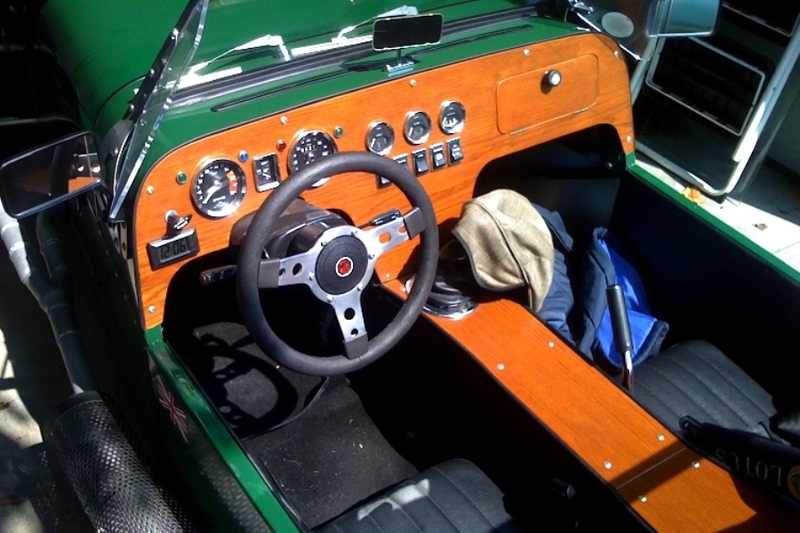 The original wheel was a classic, with a laminated wood rim hand-crafted by a master wood-worker up in Canada. It was also a Christmas gift. So for a long time we overlooked it's massive size and ignored the issues with getting in and out of the car, and tried to ignore the way it pinned our knees in place so that it was impossible to move our foot from the gas pedal to the brake in under two seconds, which was potentially two seconds too long in a pressure situation. So we ordered the cheapest leather-wrapped 13" steering wheel we could find on eBay, and installed it on the car in minutes. We really like the amount of room it affords our knees. It's not just safer, it's more comfortable. The clutch dead pedal is much more accessible and we can actually heel-and-toe now, a total bonus. The downsides of the new wheel are not as bad as we originally thought. 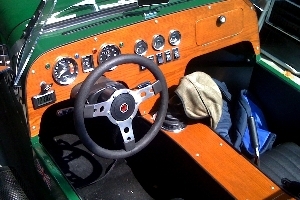 The speedometer and tach are partially hidden, no big deal, and the increased steering effort is almost imperceptible. The biggest downside of the new wheel is the way it looks. The old wheel was just classy. It made the whole car look better. You could argue that the new wheel is sportier, but I'd have to disagree. 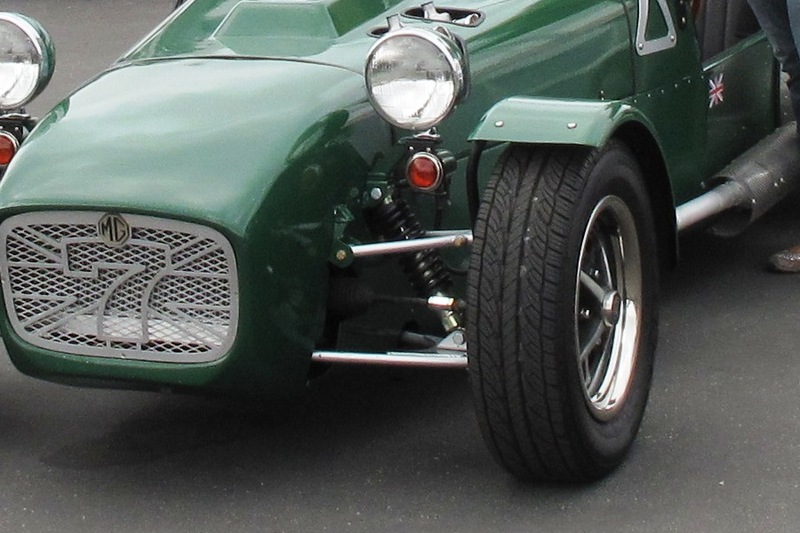 It looks like something out of a dune buggy, not that there's anything wrong with dune buggies. 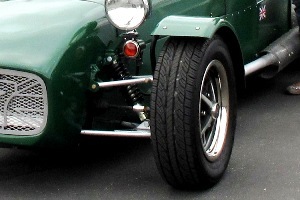 The wheel also doesn't appear to have been made with the finest materials and workmanship. I'm not sure what kind of farm animal they got this leather from, but about three-quarters of the world's vinyl looks better. Maybe it'll improve with age. In any case we're glad all of the replacements worked out and we didn't have any leftover parts, and we're also happy that it's all behind us and we don't have to take anything apart and thereby disable the car at any time in the foreseeable future. As of now our Locost has officially moved from the reliable to the very reliable category, with limited oil usage, full-time charging, and a choke cable that stays where you put it. Driving to work and back has now become the highlight of our day, except when they have Mac and Cheese in the cafeteria, which is a slightly bigger highlight.